What a joy it was to attend FVTC’s annual Community Open House event this week. The energy was just terrific and I enjoyed talking with prospective students, sometimes with their parents, with our faculty and staff, a few graduates, and several of our current students who were assisting tremendously with this event. It’s no small undertaking to welcome over 2,500 guests to not only the Appleton campus, but simultaneously to our campus locations across five counties. As always, many wonderful people helped to make this a great event. It was interesting talking with high school seniors who knew exactly what they were going to pursue and getting some details about enrolling next fall, as well as some who were attending to explore a wide range of career options. Some parents came with a list of prepared questions; others were as interested in pursuing new career options themselves as they were their son or daughter’s post-secondary plans. With so many great career opportunities available in our region in the technical fields, it was gratifying to see the keen interest by both students and parents in jobs available, our connections with employers, graduate placement rates, and future growth opportunities. In fact, many companies in our area are counting on them pursuing technical fields like automated manufacturing, machining, diesel technology, IT, administrative professional, nursing, and many more. While we can’t hold an open house event like this every month, our doors are always open to both individuals and employers who are looking to improve their futures with skill sets that are in demand. Do you have ideas about ways we can strengthen our community connections in an effort to connect more people with these opportunities? Our Culinary students create a mouth-watering entree at the event. Two weeks ago I, along with our Interim Dean for Service and Hospitality, Kim Olson, attended an event in Sheboygan that focused on the hospitality sector of our state’s economy. 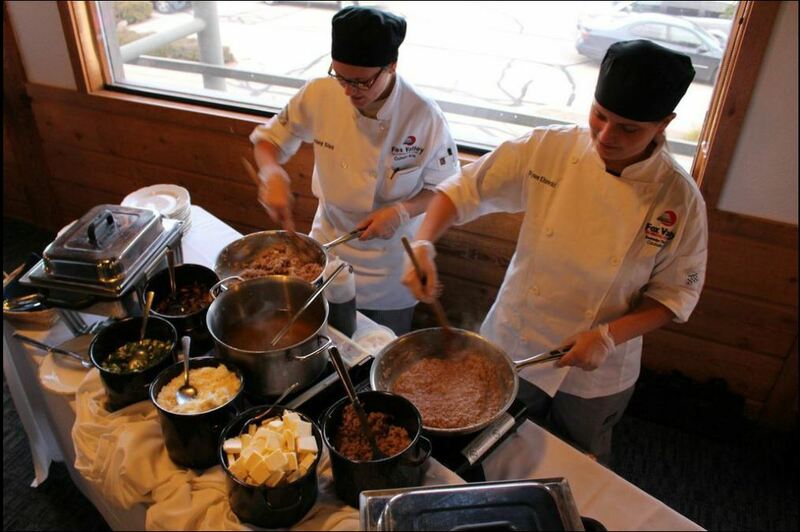 The event, sponsored by the Wisconsin Technical College System, featured savory food items prepared by Culinary Arts students and led by the faculty from Fox Valley Technical College, Moraine Park Technical College and Lakeshore Technical College. It also featured several speakers who each brought an interesting perspective regarding this industry—Morna Foy, WTCS President; Paul Bartelt, President/CEO of Vollrath Company; Chef Stefano Viglietti, Restauranteur; and Jason Mengel, Championship Director for the PGA of America.